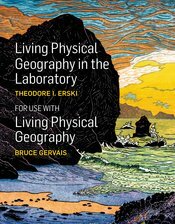 Explore the associated text, Living Physical Geography, by Bruce Gervais! Living Physical Geography in the Laboratory contains a set of 30 labs covering wide-ranging topics from remote sensing to biogeography, plate tectonics, soils, and glaciation. Structured with flexibility in mind, each lab is divided into self-contained modules while equipment and supplies are kept to a minimum.